St. Martin's Griffin, 9781250059307, 336pp. Twelve romantic holiday stories by twelve bestselling young adult authors edited by Stephanie Perkins. STEPHANIE PERKINS has always worked with books—first as a bookseller, then as a librarian, and now as a novelist. She's the author of the international bestsellers Anna and the French Kiss and Lola and the Boy Next Door, as well as Isla and the Happily Ever After. 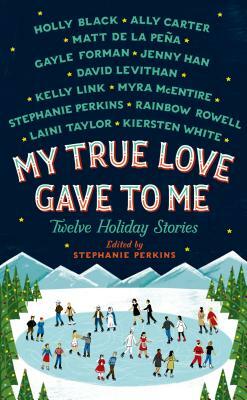 My True Love Gave to Me: Twelve Holiday Stories is her first anthology. Stephanie and her husband live in the mountains of North Carolina. Gayle Forman is an investigative journalist who's traveled the world to report for such publications as the New York Times Magazine, The Nation, Glamour, Elle, Details, Travel & Leisure, Budget Travel, Jane, and Seventeen. Gayle and her husband, Nick Tucker, are back at home (for now) in New York City with their baby daughter, Willa. David Levithan is the author of The Lover's Dictionary and many acclaimed young-adult novels, including the New York Times bestselling Nick & Norah’s Infinite Playlist (with Rachel Cohn), which was adapted into a popular movie. He is also an editorial director at Scholastic. Kelly Link is the author of two collections, Stranger Things Happen, and Magic For Beginners (one of Time Magazine's Best Books of the Year). Stories from her collections have won the Nebula, Hugo, World Fantasy, Tiptree, and Locus awards, and her work has recently appeared in A Public Space, Firebirds Rising, and Best American Short Stories 2005. Link and Gavin J. Grant started Small Beer Press in 2000. They have published the zine Lady Churchill’s Rosebud Wristlet (“Tiny, but celebrated” — Washington Post) for ten years. An anthology, The Best of Lady Churchill’s Rosebud Wristlet, will be published this autumn. New York Times best selling young adult author Laini Taylor contributed to My True Love Gave to Me: Twelve Holiday Stories. “Stunning and diverse, this holiday anthology is pure magic. This is what all anthologies should aspire to be.” —RT Book Review, 4.5 stars, "Top Pick"